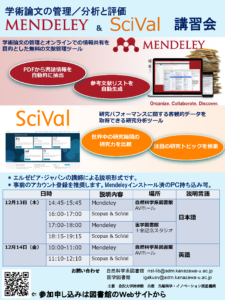 We are going to hold workshops on the papers management tool “Mendeley” and research analysis tool ”SciVal”as the following schedule. Please participate in the convenient date and time. It should help you to collect papers efficiently and come in useful for your research! * We arranged an instructor sent from Elsevier. 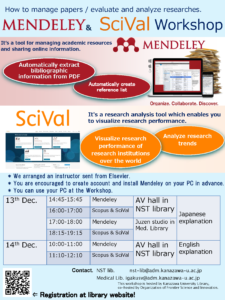 * You are encouraged to create account and install Mendeley on your PC in advance. * You can use your PC at the Workshop. Kindly informed that advance registration is closed; however, it is open to all student/faculty member. Please directly come to register at the reception desk on site.